Many people believe that headaches are caused by loud noise, being tired, or being stressed. While these are all factors that can lead to headaches, the direct cause is tightness in the neck and shoulders. The tightness can cause misalignments in the vertebrae of your neck, resulting in pain. 80% of all headaches originate from the neck. A person usually feels pain starting at the base of the skull which radiates into the temples, eyeballs, and forehead. Massage of the neck and shoulder muscles can release tension, and a chiropractic adjustment can realign the vertebrae in your neck. Lakewood Chiropractic can help eliminate the cause of your headaches rather than offering a temporary relief from the symptoms. 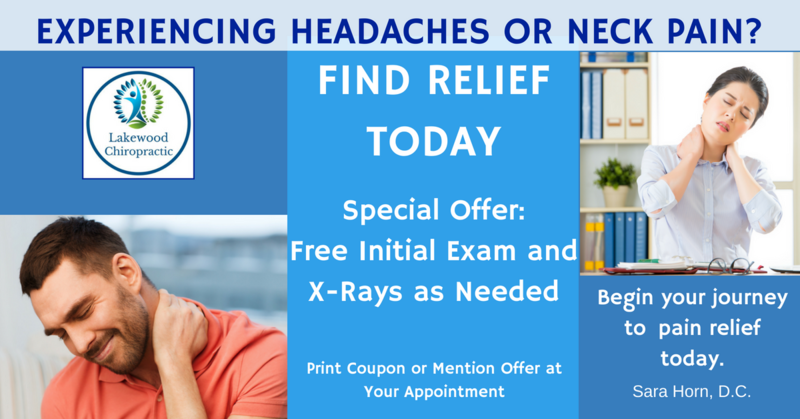 If you are experiencing headaches, neck pain or back pain, schedule a complimentary exam and consultation today and begin your journey to pain relief today. At Lakewood Chiropractic, your initial exam is always FREE. Fill out the appointment request form below and our staff will be in touch shortly. You may also call us at 816-373-3373 or chat with us online. We look forward to hearing from you!